My wife Katy and I sign indemnity forms acknowledging that tracking rhinos on foot is an "inherently dangerous activity". Joseph, our guide, checks that we are not wearing any bright colours. Walk in single file, he instructs us. Keep silent. No flashing or clicking cameras. Watch for hand signals telling us to freeze or retreat. Hide behind a tree or bush if a rhino charges. We are unarmed because black rhinos are a critically endangered species, with scarcely 5,000 left on earth, and cannot be shot in any circumstances. Beneath a late afternoon sun and vast African sky, we set off into the boundless expanse of parched but pristine bush that forms the Sera community conservancy in northern Kenya - or more specifically, into the 500 sq km rhino sanctuary in its heart. We follow two rangers, one of whom carries an aerial which receives signals from microchips implanted in the rhinos' horns and tells us roughly where they are. For the best part of an hour, we hike through thorny scrub, across dried-up streams, beneath flattopped acacia trees festooned with the round nests of weaver birds. We spot the tracks of rhinos, elephants and giraffes in the red soil. We disturb tiny antelope, called dik-dik, and all manner of strange and exotic birds. The Ultimate Travel Company (theultimatetravel company.co.uk) offers a package composed of a three-night Walking With Rhino itinerary at Saruni Rhino lodge, two nights at the private Lewa Wilderness Conservancy and two nights at private lodge Saruni Samburu, plus non-stop flights from Singapore to Nairobi in Kenya, costing from US$7,850 (S$10,700) a person. From Nairobi, a domestic flight takes the traveller direct to Lewa. From Lewa, fly or drive to Saruni Samburu, which is an hour from the nearest airstrip. A three-hour drive takes you from Saruni Samburu to Sera, where the black rhinos roam. All meals, drinks, activities and private transfers are included. 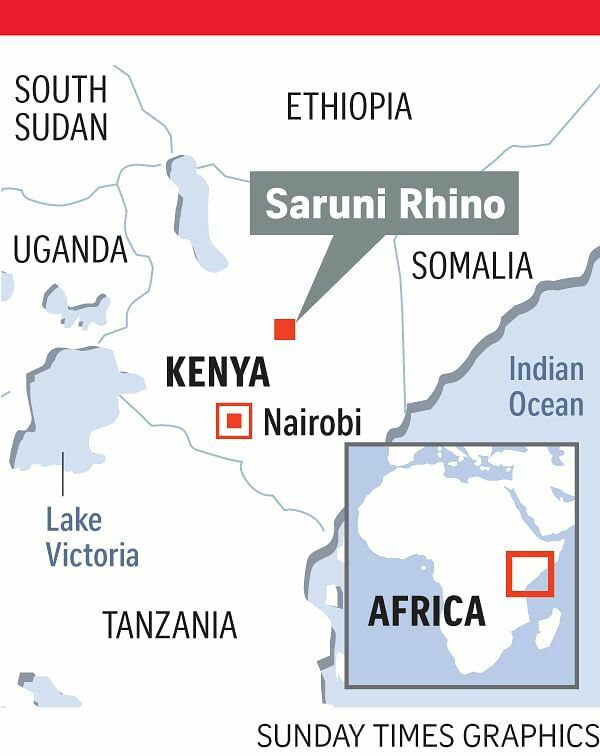 At Saruni Rhino, US$175 a guest a day, from the package price, goes to the Sera conservancy, which includes a rhino sanctuary. The Ultimate Travel Company, based in London, is an African specialist whose bespoke safaris across northern Kenya showcase the benefits of community conservation initiatives championed by the Lewa Wildlife Conservancy. Whenever the rangers stop to check for signals, we admire the sublime views of endless plains punctuated by distant blue mountains. Periodically, Joseph shakes ash from a sock to tell which way the breeze is blowing. Rhinos have poor eyesight, but very acute smell and hearing so it is essential we remain downwind of them. And then we see our quarry - a two-tonne male - on the far side of a clearing, though rhinos are so well camouflaged that spotting them is never easy. We hide behind a dead thorn bush with a towering red termite mound in the middle. We watch the creature slowly cross the clearing, browsing as he goes. But at the far side, he turns and begins moving straight towards us. On he comes until he reaches our thorn bush - not 5m from where we are standing motionless, barely daring to breathe, agog with a mixture of fear and excitement. He has no idea we are there, though he is so close that we can see every fold in his leathery skin, the marks on his horns and the hairs on his swivelling ears. Then an oxpecker bird, that is perched on his back, begins to trill. Alarmed, perhaps, the rhino turns and trundles rapidly away into the bush. We have seen rhinos before, but always from the safety of a sturdy vehicle. Never on foot. Never so intimately. And never in such utter wilderness. Indeed, nowhere else in East Africa can you track them in this way. Sera is one of 33 community conservancies that make up the Northern Rangelands Trust (NRT) - 44,000 sq km of remote, tribal territory in what was known in colonial times as the Northern Frontier District and that was off-limits to most whites. I first came here in late 2013 to write about the rampant poaching that had seen more than 100 elephants killed for their tusks that year alone and seemed totally out of control. In fact, the tide was just beginning to turn. The NRT was in the process of persuading the tribes that their wildlife was worth much more alive than dead. It was offering them financial support, security, jobs and tourism if they confronted the poachers, most of whom came from neighbouring Somalia. "At first, it was like an almost missionary act of persuasion, but now it's completely flipped," says Mr Ian Craig, a leading conservationist who had developed the celebrated Lewa Wildlife Conservancy much further south before launching the NRT in 2004. Last year, just eight elephants were killed in the NRT's conservancies. Poaching has diminished so much that in 2015, Mr Craig moved 13 black rhinos to the custom-built Sera sanctuary, which is ringed by a US$2-million (S$2.7-million), 4m-high fence. They were the first rhinos to be returned to their natural habitat in northern Kenya since being hunted to near extinction there in the 1980s. Mr Craig admits it was a huge gamble, as a single rhino's two horns are worth as much as US$400,000 in Ho Chi Minh City or Shanghai, where they are ground down and falsely proffered as a cure for almost any ailment you can think of. In the event, three rhinos died in the move, but the rest have flourished. Two have had babies. Three more are pregnant. Not one has been targeted by poachers. Moreover, the chance to "walk with rhinos" looks set to create a very select, but lucrative tourist industry and, in February, an extraordinary little lodge opened just outside the sanctuary to cater for it. Saruni Rhino (www.sarunirhinotracking.com) is deep in the bush - two hours by dirt road from the nearest commercial airstrip, far beyond the range of mains electricity, television and the Internet, and so far off the beaten track that we meet children who have never seen white faces before. Its two open-fronted, luxuriously furnished, stone-and-thatch "bandas" (cottages) can accommodate a maximum of six guests. They are shaded by groves of doum palms, and overlook a "lugga" - the sandy, dried-up bed of a very broad river. The rhinos are the lodge's chief attraction, but far from its only one. You can eat lunch while whole families of elephants and other wildlife drink at a waterhole scarcely 100m away. You can dine in the evening at a table set out on the river bed beneath a spectacular firmament of stars. One night, we heard a leopard growling right outside our banda. Though owned by an Italian conservationist and writer named Riccardo Orizio, the lodge is staffed entirely by Samburu warriors and tribesmen, seven in all, and they are as open and friendly as you could wish. Indeed, to stay at the Saruni Rhino lodge is to undergo a total immersion course in a tribe every bit as proud and colourful as Kenya's better-known Maasai. Sammy, the manager, will describe the circumcision ceremony that all young Samburu males must endure to become warriors - flinch or cry out and they are shamed for life. Peter, the waiter, will display the pattern of tiny scars with which he has decorated his torso. They will teach you how to tell the social and marital status of any Samburu, male or female, by the elaborate necklaces, chains, bracelets and earrings with which they festoon themselves. Few Samburu know their exact age. Most are semi-nomadic pastoralists who drink the blood of their livestock for added nutrition. They send some of their children to school, the rest to tend the cattle, goats and sheep, which serve as currency in a largely cashless society. One morning, Joseph takes us to a Samburu village, whose huts are made of branches and animal hides and can be moved in a couple of hours. That afternoon, he and the lodge's staff stage an impressive and wildly enthusiastic spear-throwing competition for our benefit. Even more memorable is our trip to the nearby "singing wells" at Kisima Hamsini (Fifty Wells), where the Samburu and other tribes have dug through the rock below the river bed to create wells, some 2 or 3m deep, that never dry up. Arriving shortly after dawn, we find the sandy bed criss-crossed with the footprints of elephants, leopards, hyenas, buffalo, warthogs and other nocturnal visitors. As the sun rises, thousands of sandgrouse arrive, one flock after another dipping down to drink as the next ones circle overhead. Thirty minutes later, the sandgrouse vanish and the herdsmen begin emerging from the bush - old men, young boys, women and girls with cones of multi-layered necklaces tumbling over their necks and shoulders. They have walked as far as 100km to water their sheep, goats, cows and camels. How they find their way through the largely featureless bush, I have no idea. But the best is yet to come. The men strip off, clamber down into the wells and begin hauling up the water in metal cans. They pour it into troughs fashioned from the hollowed-out trunks of palm trees. As they do so, they sing to attract their livestock - less songs than rhythmic chants that come from deep in their throats, and had presumably been sung by their fathers and grandfathers before them. They claim that their animals know which well to drink at because they recognise the songs. Before we leave Sera, we have one more encounter with a rhino that is every bit as exciting - arguably more so - as the first. This time, we can hear our quarry munching vegetation in the undergrowth ahead of us, but we cannot see it. Joseph moves cautiously ahead. Soon he beckons us to follow. At that moment, we hear the rhino moving. We beat a hasty retreat, but it is too late. A huge female weighing 1.5 tonnes emerges from the bushes and stands facing us across 20m of open ground. We freeze. If she charges, we are in deep trouble, for rhinos can move extremely fast despite their bulk. The great prehistoric beast senses our presence, but cannot see us. Then she begins to advance. Joseph immediately throws a stone to her left. She hears it land, lurches towards it, then abruptly plunges back into the bushes from which she had come. We hear her crashing away through the bushes, leaving us relieved and ecstatic in equal measure. • Martin Fletcher, a former foreign and associate editor of The Times of London, was hosted by The Ultimate Travel Company of London.